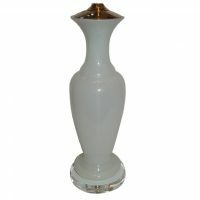 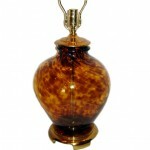 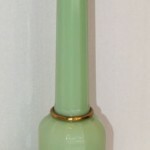 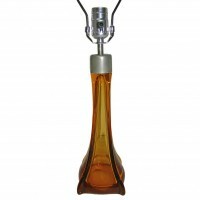 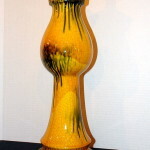 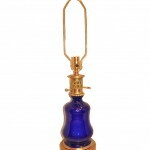 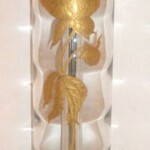 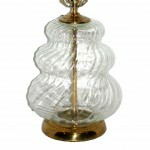 A single French 1940's cut glass column table lamp with gilt base. 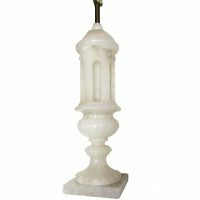 Measurements: Height of body: 29" Heigh to shade rest: 40.75" Base: 6.5" x 6.5"
Italy, Circa 1940's A circa 1940 Italian carved alabaster Neo classic style column lamp with bronze details. 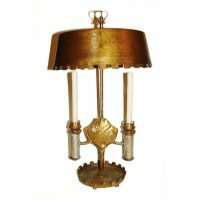 Measurements Height: 33"
A circa 1940's French bouillotte lamp. 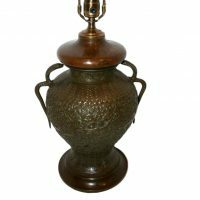 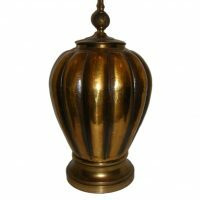 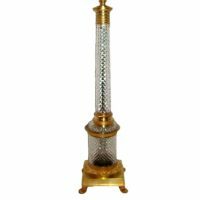 Measurements: Height: 28" Diameter (of Shade): 14"
A 19th Century Turkish hammered brass table lamp with serpentine handles. 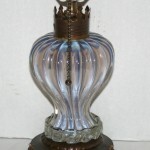 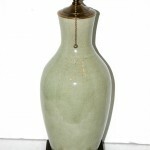 Measurements Height of body: 15.25" Height to shade rest: 24.5"
A circa 1920 French Mercury glass lamp with metal base. 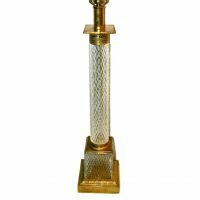 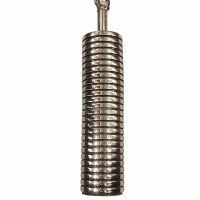 Measurements: Height of Body: 15"
A circa 1930's single French mercury glass table lamp. 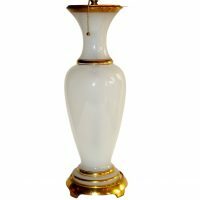 Measurements: Height of body: 19.5" Height to shade rest: 30.5" Diameter: 7"
A circa 1920's French opaline glass table lamp with original gilt base. 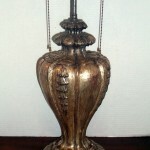 Measurements: Height of Body: 18" Height to shade rest: 27"
A circa 1930's French hammered tole palm tree table lamp. 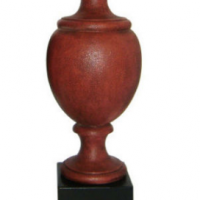 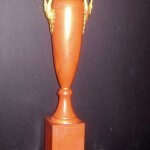 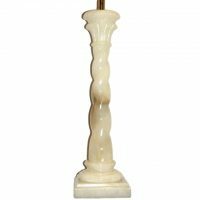 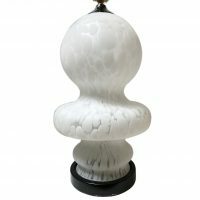 Measurements: Height: 25.75"
A single Italian 1940's carved twisted column alabaster table lamp with square base. 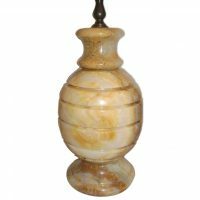 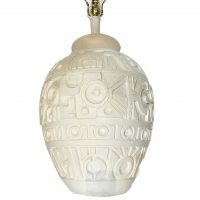 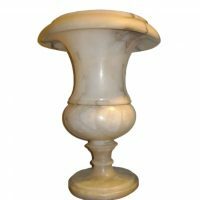 Measurements: Height of Body: 21"
A single circa 1920's Italian carved alabaster urn lamp. 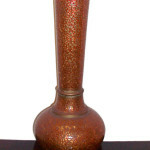 Measurements Height: 16.5" Diameter: 11.5"
A circa 1960s Italian blown glass table lamp. 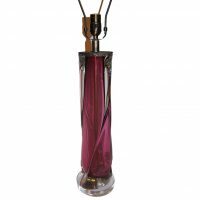 A circa 1940's blown amethyst glass table lamp with lucite base. 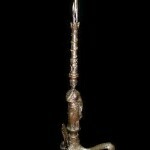 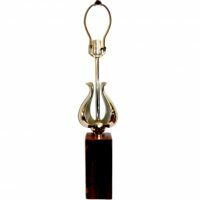 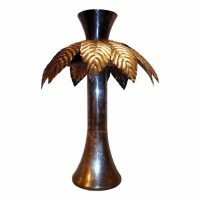 Measurements: Height of body: 20"
Circa 1900 French bronze dolphin-shaped single table lamp. 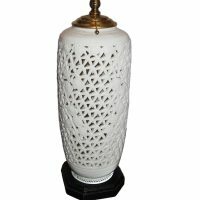 Measurements: Height of body: 8.25" Height to shade rest: 16.5" Diameter: 7"
A circa 1920 Italian carved alabaster table lamp with pierced body. 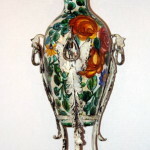 With interior light. 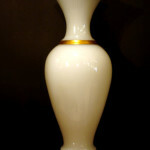 13.5 height of body 209 East 59th Street. 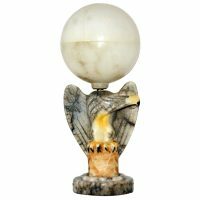 A single circa 1920's Italian carved alabaster lamp in the shape of an eagle and alabaster globe with interior light. 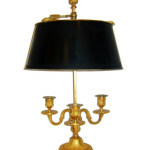 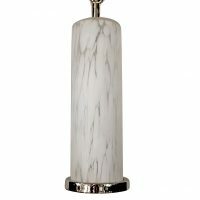 Measurements: Height: 11"
A circa 1940's Italian solid onyx table lamp with ridges on body. 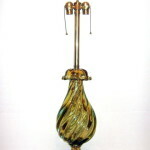 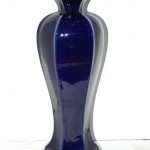 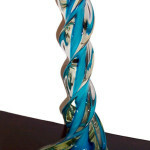 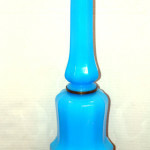 Measurements: Height of body: 14" Height to shade rest: 22" Diameter: 6.5"
A circa 1940’s Italian Murano glass table lamp. 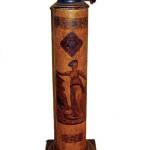 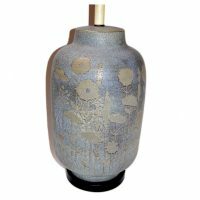 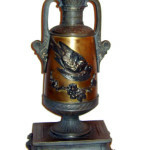 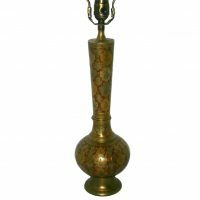 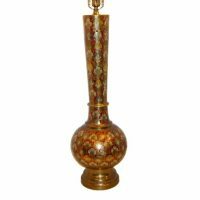 A single circa 1930's Turkish hammered and enameled brass table lamp with foliage and floral motif on body. 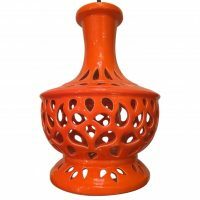 Measurements: Height of body: 15.5" Height to shade rest: 25"
A single orange circa 1950's Italian porcelain table lamp with pierced open-work body. 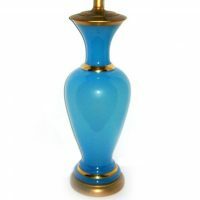 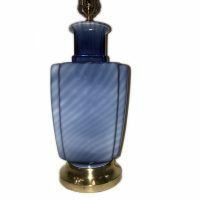 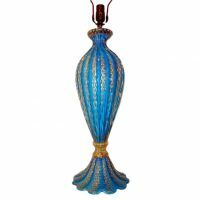 Measurements: Height of body: 15" Diameter: 10"
A circa 1950's Italian shell table lamp, with single interior light Measurements: Height: 8.75" Widest point: 6"
A circa 1940's single hand-blown blue Venetian glass table lamp with gold details. 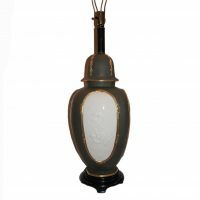 Measurements: Height of body: 23" Height to shade rest: 33"
A circa 1930s French blue opaline table lamp with gilt details. 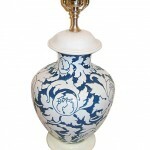 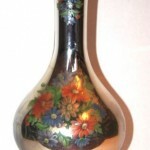 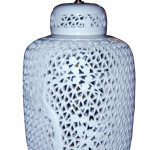 A circa 1960's Italian porcelain table lamp with floral decoration. 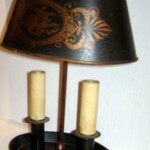 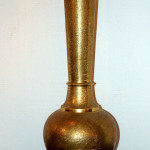 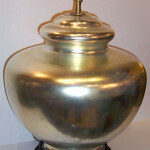 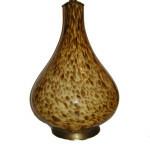 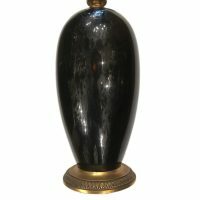 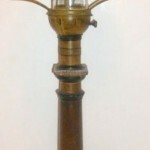 Measurements: Height of body: 19" Height to rest of shade: 31"
A circa 1940s hammered brass table lamp with wooden base. 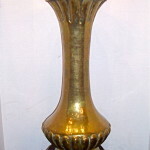 Measurements Height of Body: 26"
A single large Italian circa 1940's hammered brass table lamp with original patina. 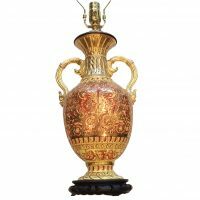 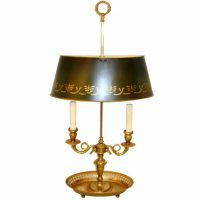 Measurements: Height of body: 19" Diameter: 14"
A circa 1940s hammered and etched brass table lamp with elaborate foliage and arabasque motif. 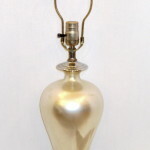 Measurements: Height of Body: 26"
A circa 1930's French mercury glass table lamp. 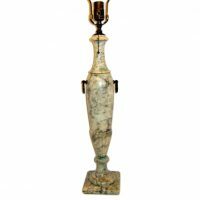 French, circa 1920's mercury glass table lamp. 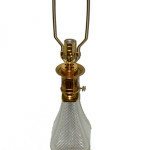 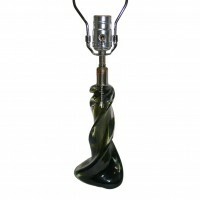 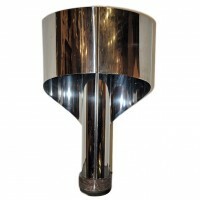 Circa 1960's Italian nickel plated table lamp. 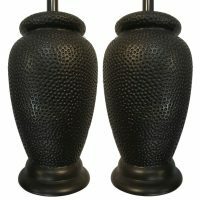 Measurements: Height of Body: 18.5"
A pair of unique circa 1950's Italian textured ceramic table lamps. 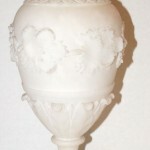 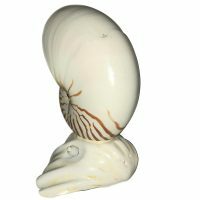 Measurements: Height of body: 15″ Diameter: 6"
Italian circa 1930's carved alabaster table lamp. 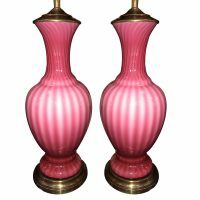 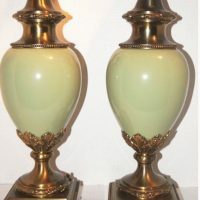 Measurements: Height of Body: 25"
Pair of 1940's Murano blown glass table lamps with brass bases. 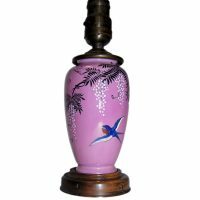 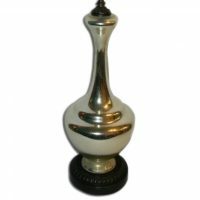 Measurements: Height of body: 20"
A single circa 1900 hand-painted Persian ceramic vase converted to table lamp with wooden base. 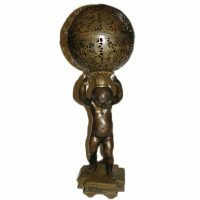 Measurements: Height of body: 14" Diameter: 8"
A 1920's French pierced metal lamp in the figure of a child with globe with interior light. 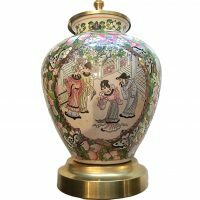 Measurements: Height: 26.5" Diameter: 9"
A 19th Century Japanese porcelain vase mounted as lamp. 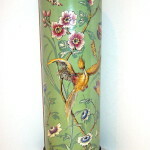 Pink with birds and floral decoration. 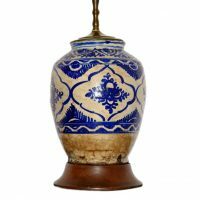 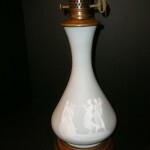 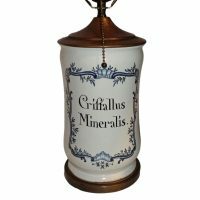 Measurements: Height of body: 8" Diameter of base: 3.75"
A circa 1900 Italian porcelain apothecary jar mounted as a lamp. 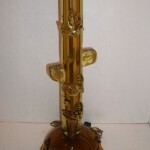 Measurements: Height of Body: 14"